While the highly inflated value of the U.S. Retirement Market reached a new high this year, something is seriously wrong when we look behind the scenes. Of course, Americans have no idea that the U.S. Retirement Market is only a few steps from falling off the cliff, because their eyes are focused on the shiny spinning roulette wheel called the Wall Street Stock Market. Yes, everyone continues to place their bets, hoping and praying that they will win it big, so they can retire in style. Unfortunately, American gamblers at the casino have no idea that the HOUSE is out of money. The only thing remaining in their backroom vaults is a small stash of cash and a bunch of IOU’s and debts. Is most certainly a good moral booster for Americans. As their retirement assets continue to increase, this provides them a wonderful incentive to fork over more of their hard-earned monthly income to feed the DARK HOLE I label the U.S. Retirement PAC-MAN Monster. Regretably, Americans have no idea that their monthly retirement contributions are not being saved or stored in a nice gold vault, rather they are being used to pay the lucky slobs who retired before them. Now, when I say SLOBS or POOR SLOBS, I am not being derogatory. However, I am using the word as a Wall Street Banker would label those they prey upon. 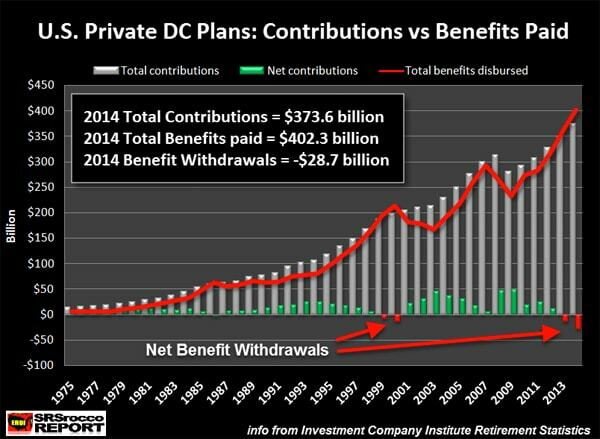 As we can see in the chart, the Private Defined Contribution (DC) Plans paid out $28.7 billion more than they took in in 2014…. the last year the Investment Company Institute provided data. Simply, Private DC Plans are mostly 401K’s. If we look up at the first chart with the colorful breakdown in the different U.S. Retirement Plans, DC Plans (mostly 401K’s shown in YELLOW) were valued at $7.3 trillion. 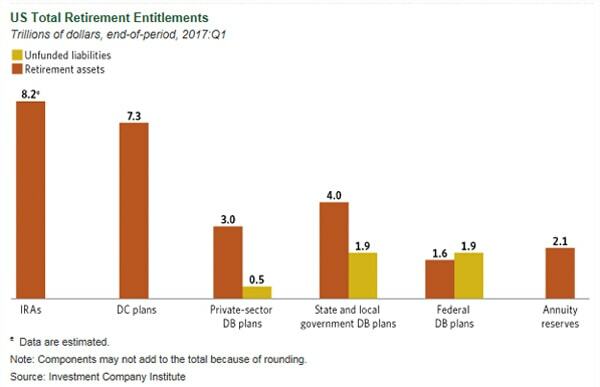 To see U.S. DC plans now paying out more than they receive is certainly bad news… but it isn’t as bad as what is taking place in the U.S. DB – Defined Benefit Plan market. A Defined Benefit Plan is where an employer pays the employee a specific pension payment, based on the employees earning history. The GREEN BARS show how much is paid out to retired employees, the BLUE BARS are what is contributed into the DB Plan, and the RED BARS denote how much more is going out than coming in. It doesn’t take much of a brain surgeon to figure out this is not sustainable. 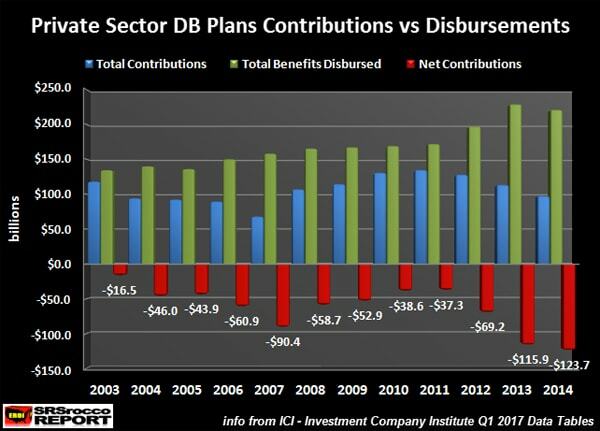 As of the last year the Investment Company Institute published the figures (2014), $123.7 billion more was paid out to employees in the Private Sector DB Plan then came in. While larger payouts have been going out than funds coming in for quite some time, they have also reached a new RECORD HIGH. Ain’t records great? 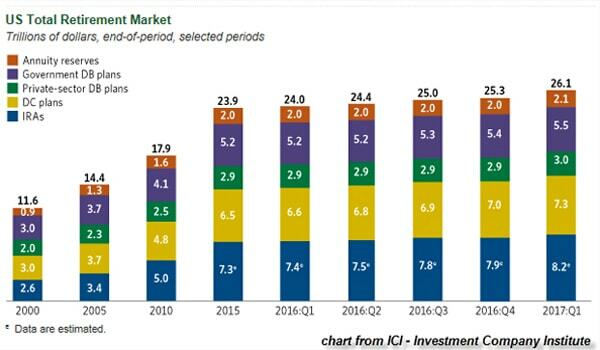 The Private Sector DB Plan is shown in the nice GREEN COLOR above at $3 trillion in assets. Again, these are from the Private Sector. If we look at the Government DB Plans in PURPLE, they are valued at $5.5 trillion. 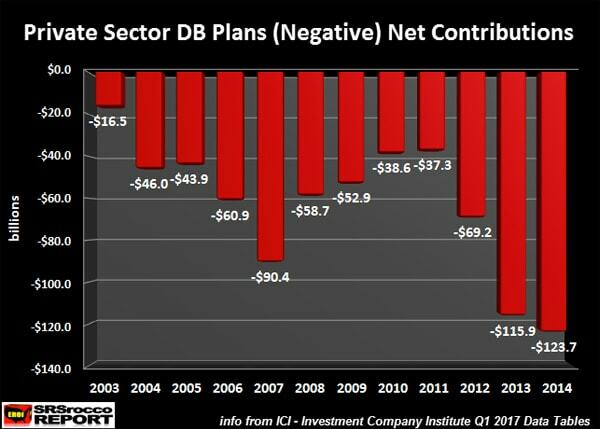 Unfortunately, the Government DB Plans (State & Federal) Pension Plans are in much worse shape than the Private Sector DB Plans. The Private Sector DB Plans are underfunded by $500 billion, while the Federal and State-Local DB Plans are underfunded by $3.8 trllion (adding both columns together). Even more amusing is that the Federal DB Pension Plans hold a larger underfunded liability than their total assets. While we have heard in the news that the State Pension Plans are in big trouble, we can plainly see the Federal Govt Pension Plans are in much worse shape… LOL. FIRST.... If our eyes are not glued to the TV watching CNBC, we should be able to realize that stocks are highly inflated via their extremely bloated P/E – Price to Earnings ratio. So, that $1.08 trillion of Corporate Equities will most certainly collapse in value in the future. This is bad news for both the poor slobs who have been paying in for decades and those retirees who were counting on that monthly income to pay for their $250,000 RV Motor Coach. SECOND.... I find it extremely hilarious that “Debt Securities” valued at $884 billion, can be labeled as “Assets.” Yes, I realize that U.S. Treasuries and Foreign Bonds have been assets in the past, but where we are heading… supposed assets will turn into liabilities, quite quickly. THIRD.... $844 billion in Misc Assets are not something I would feel comfortable being invested in. Sure, I could see possibly $20-$50 billion in Misc Assets, but $884 billion? This reminds me of Misc chicken parts used to make McDonalds high quality Chicken Nuggets. FOURTH.... Mutual Funds are worse than plain ole stocks… if you ask me. Mutual Funds are claims on claims on stocks. So, this segment of the U.S. Private Sector DB Plan is one that will turn to into vapor quicker than most when fan hits the bull excrement. 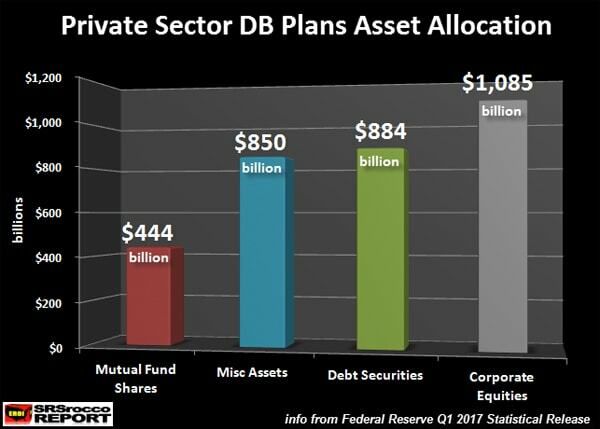 While the bloated $3 trillion Private Sector DB Plan Assets are only a small portion of the total U.S. Retirement Market, we can assume the disease has spread throughout the entire $26.1 trillion market. Lastly, it took me a while to come to this conclusion, but I now realize why the Fed and Central Banks pushed all that PHAT QE Money into Stocks, Bonds and Real Estate. If we are already seeing many sectors of the U.S. Retirement Market paying out more funds than are coming in… what in the living HELL does the U.S. Retirement Market look like when Stock, Bond and Real Estate values plummet? That’s right..... it’s going to be BIG, BAD & UGLY.